Frazzled but No Need to Fight. As I prepare for my day, waking up 30 minutes late after turning off my alarm, I am frazzled. I look at my schedule and I feel that all too familiar “want to give in and put the covers over my head” feeling. I’m not exactly sure how I can keep going into each day at this pace and with my imaginary fists up ready to be on guard all day! But then the Lord spoke to me. And I stopped and took time to pray and read my devotional and write. Now I’m ready. Because I realize I don’t have to do it. He will do it for me. 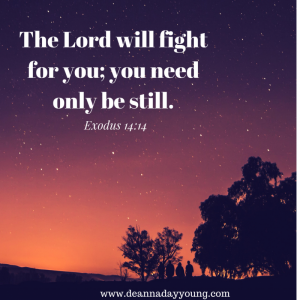 This entry was posted in devotional, inspirational, motivational, spiritual on October 11, 2017 by Deanna Young.